A teenager has been charged with stabbing two young men to death in north London. 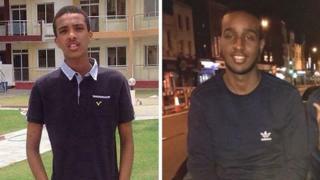 Isaiah Popoola, 18, was charged on Sunday evening with the murders of Abdikarim Hassan, 17, and Sadiq Adan Mohamed, 20, in Camden on Tuesday. He has also been charged with causing grievous bodily harm (GBH) and attempted GBH of two other victims in attacks on the same night. Mr Popoola is set to appear at Highbury Magistrates' Court later. Four other men, aged 24, 23, 20 and 21, were arrested on suspicion of causing GBH on 21 February. The first stabbing happened near a block of flats on Aldenham Street at about 20:00 GMT on 20 February. Half an hour later Mr Hassan was found with fatal injuries in Bartholomew Road. At 22:13, officers found Mr Adan Mohamed on Malden Road. He had also been stabbed, and died at the scene.